Camping in a Camper Van, with all the amenities you could want! Looking for a campsite in Sardinia that’s suitable for camper vans? 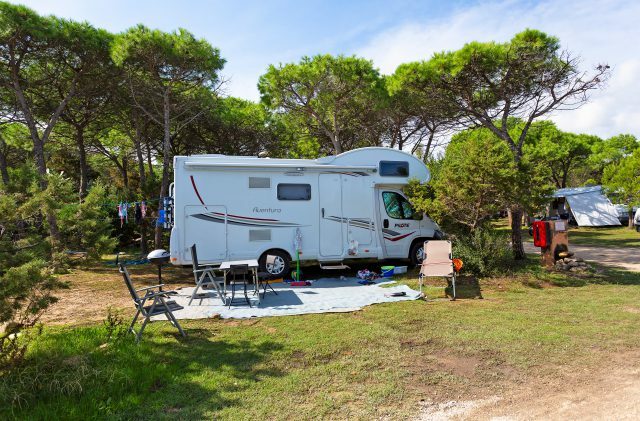 At Camping Cala Ginepro, you’ll find spacious pitches for camping in camper vans, to allow you to enjoy a truly comfortable holiday in Sardinia. Visiting Sardinia in a camper van is a unique experience, offering delightful itineraries and unforgettable landscapes. Located on the eastern coast of the island, our seaside campsite offers an array of different pitches, allowing you to spend your holidays in a camper van, with the convenience of the numerous amenities on offer, in the magical surroundings of the Gulf of Orosei. With a total of three access routes the shore – two to the wonderful beaches of Cala Ginepro and Sa Mattanosa and one to the evocative reef – you can choose from three different options for your days of fun in the sun. Moreover, in the immediate vicinity of the campsite, you can also visit the enchancing Biderosa Nature Reserve or the wild Berchida beach, to name just a couple of the jewels to be found nearby. If you’re only planning a short trip, we would recommend that you stay a few days longer to explore the setting of extraordinary natural beauty in which the campsite is immersed. Indeed, Camping Cala Ginepro is an excellent base for excursions on foot, by canoe or mountain bike. Windsurfing equipment, canoes and mountain bikes are available for hire at the campsite. We recommend that you book your pitch in advance, especially during the busy summer season; in autumn and winter, there is usually plenty of choice. Find out more about all of the services designed for you and your family’s holiday by camper van! discover all of the facilities! The entertainment service is offered from 15 June to 31 August. Admission and parking for one car or motorbike included in the price.